Today is Cyber Monday and there are oodles of online sales that I’m sure you’ve already started checking out but if you haven’t seen this one yet, you better not miss it! Only72 is having it’s 72 sale of the year and they have upped the ante yet again. This sale contains two tiers of entrepreneurial guides to help you start or grow your business like nothing else out there can. These guides were written by a slew of your peers that have already been there, done that in the entrepreneurial world. Their experience is unmatched in online business. Check out the sale by clicking this link. Tyler Tervooren, Nick Reese, Scott Young, Shane Ketterman, Sean Ogle, Chris Garrett, David Risley, Sean Malarkey, Lewis Howes, James Clear, Srini Rao, and Danielle LaPorte, Chris Guillebeau, Pam Slim, Desiree Adaway, Ashley Ambirge, Johnny B. Truant, Greg Rollett, Laura Roeder, Corbett Barr, Erica Douglass, David Risley, Jonathan Mead, Jen Gresham, and Charlie Gilkey. 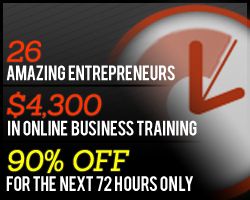 You’ve got 72 hours – don’t miss this sale of over 89% off on the best information on entrepreneurship out there. Click here to check it out.